Come, peer with me now into the all-seeing Orb of Agamotto for a glimpse into the future of the Doctor Strange movie: star Benedict Cumberbatch filming on the set in n Kathmandu, Nepal. These scenes would appear to be set early in the movie, when disgraced surgeon Dr. Stephen Strange is searching for a cure for the nerve damage to his hands. I have to admit, it is cool to know that production has officially begun on the adaptation of my all-time favorite comic book character — even if I do have very mixed feelings about this production. I am happy that the movie is being made, but I have serious issues with the casting of Cumberbatch in the lead. He’s a good actor, IMHO, but there has grown up around him a bloated fandom that feels almost like a cult of personality. I really do not understand the slavering awe and worship with which Cumberbatch is treated. It’s like he’s the greatest actor of all time. And this cult of personality will definitely clash with the movie. BC will tower over the film and distract from discussion of the film on it’s own merits. It happened with Star Trek: Into Darkness. After he was cast, all anyone wanted to talk about was, “Who is Benecict playing? “Is he Khan?” “He’s Kahn, isn’t he?” (And, despite outright lying by the studio, he indeed was playing Khan.) I just don’t want everything about Doctor Strange reduced to whether the Cumberbitches (look ’em up) like his hair in a particular scene. It’s just not fair that my guy is likely going to be crushed under the weight of his own star. But hey, I should be grateful that Marvel and Disney are willing to pour some cash into this production — unlike the 1978 TV movie made for CBS. And, yes, Cumberbatch is an improvement on Peter Hooten. Directed by Scott Derrickson and co-starring Tilda Swinton (Ancient One), Rachel McAdams, Mads Mikkelsen, Chiwetel Ejiofor (Baron Mordo) and Michael Stuhlbarg (Nicodemus West), Doctor Strange will be released Nov. 4, 2016. Here is a mighty selection of photographs taken during the filming of this week’s episode of DOCTOR WHO, “Robot of Sherwood” at Caerphilly Castle in South Wales, featuring Peter Capaldi as the 12th Doctor and Jenna Coleman as Clara. “Robot of Sherwood” airs tomorrow at 9 p.m. on BBC America. New Doctor Meets Old Friend – and Foes! The 12th Doctor teamed with a trusted ally while encountering a dogged old foe as Peter Capaldi continued to film his debut series of DOCTOR WHO on the streets of Cardiff, Wales, yesterday (June 30). Wales Online captured a large number of photos of the location filming at The Friary in the middle of Cardiff, but I put the gallery after the cut because the images are very spoilery. Today marks the start of principle photography on J.J. Abrams‘ Star Wars: Episode VII, and this is the first official set photo, tweeted by production company Bad Robot with the only caption being #dayone. The first slate offers no clues about the official title of the episode, even as speculation continues to swirl that it will be called The Ancient Fear. 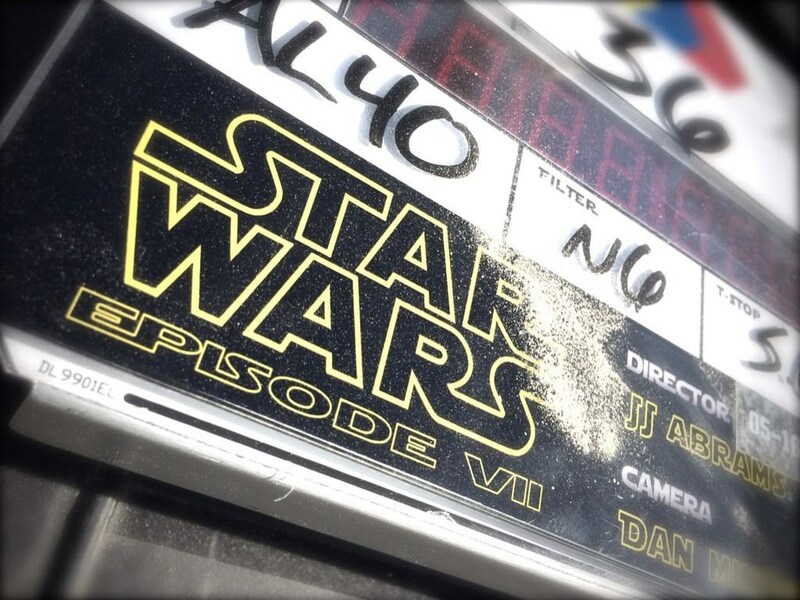 However, notice the sprinkle of sand on the clapper board — does that suggest an exterior on Tatooine? Dec. 18, 2015 seems both a little bit closer and a lot further away right now. Robert “Iron Man” Downey Jr. Tweeted out his first official pic from the set of Avengers: Age of Ultron, and it is… well, not exactly action-packed. The image shows RDJ in a yellow reflective vest, standing next to executive producer Jeremy Latcham. 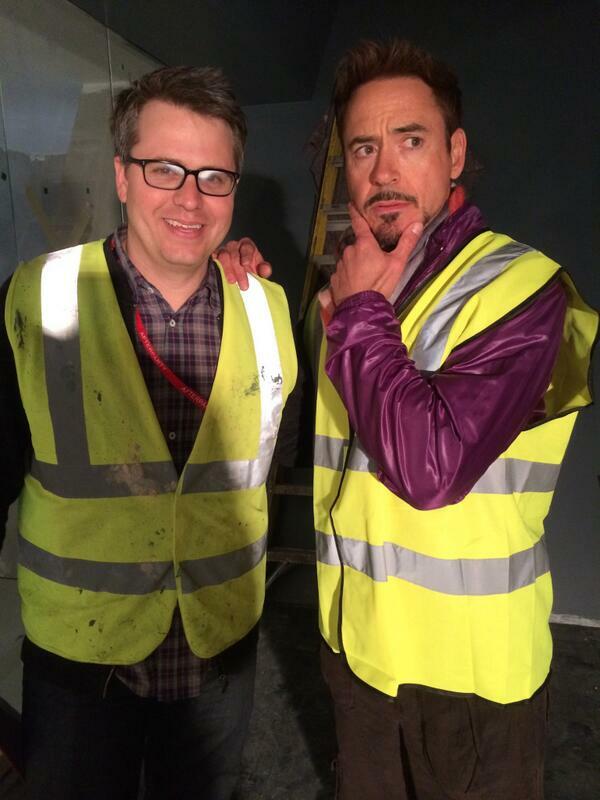 Well… perhaps that purple jacket Downey is wearing is part of his Tony Stark costume? DOCTOR WHO Guest Character Confirmed: Spoiler! Well, there’s now photographic proof that one of the characters/monsters Peter Capaldi‘s 12th Doctor was rumored to encounter in series eight of DOCTOR WHO is definitely happening! If you don’t want to know who/what it is, then move along to something else. If you do wish to know, then make the jump — but beware: SPOILER!